Home Events What Matters to You “What Matters To You?” Virtual Launch! “What Matters To You?” Virtual Launch! 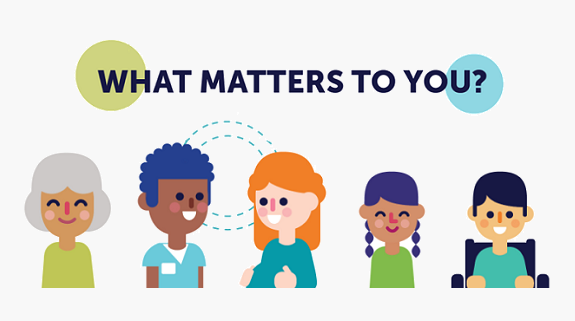 “What matters to you?” started in Norway in 2014 with the aim of “encouraging and supporting more meaningful conversations between people who provide health and social care and the people, families and carers who receive health and social care.” What began as a national effort has gained momentum as an international movement with over 30 countries around the world participating. Conversations That Matter: How to Embed the Question into Practice. Lillian, along with her team, participated in “What Matters to You” Day in 2017 and have incorporated the question into their practice each and every day. The Power of the Conversation: Where the Magic Is. Linda will speak about the power of asking, “What matters to you?” and the impact on care. As a bonus, we will randomly give away 10 free #WhatMattersToYou t-shirts to attendees! You don’t want to miss out on your chance to win! Attending this webinar? Join our Facebook event & share with your network!